Easy web publishing with iPhone code. Sorting your digital files is relatively straightforward, but what about your real-world possessions? This is where Delicious Library comes in. Now at version 2, its purpose is to help you keep track of your belongings, catalogue them and sort them onto neat digital shelves. A lot has changed since version 1. For one thing, Delicious Library 2 (priced $40) is now Leopard-only, as it takes advantage of a lot of technologies unique to that system. Version 1 is still available for only $20 if you haven't yet upgraded to Apple's latest and greatest. New features abound. 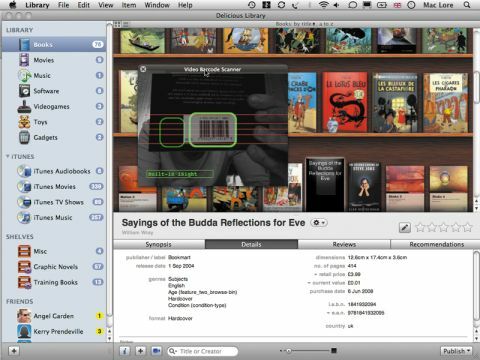 You can browse your iTunes catalogue straight from Delicious Library 2's interface. Web publishing is a trivial affair with the use of simple, elegant templates. You can upload to your .Mac account and send the pages to iWeb or to your own website. Each page comes with iPhone-specific code designed to display a custom, more readable layout when seen using Apple's latest mobile hardware. You can also browse other users' published libraries via either the internet or your local network. Plus, any item you have out on loan is added automatically to iCal to make it easier to know when you should expect it back. This is a beautiful application and a lot of thought and care has been put into it. It's worth downloading the trial version just to see how a 'best of breed' application works. However, despite all that attention to detail, it feels as if its target audience may be somewhat limited. But if you're fanatical about cataloguing your belongings or just need a comprehensive list for insurance purposes, this application is for you.